Magnolia is one of Seattle's largest neighborhoods. It sits on its own peninsula northwest of the city on Smith Cove, Shilshole Bay, and Elliott Bay in the Puget Sound. 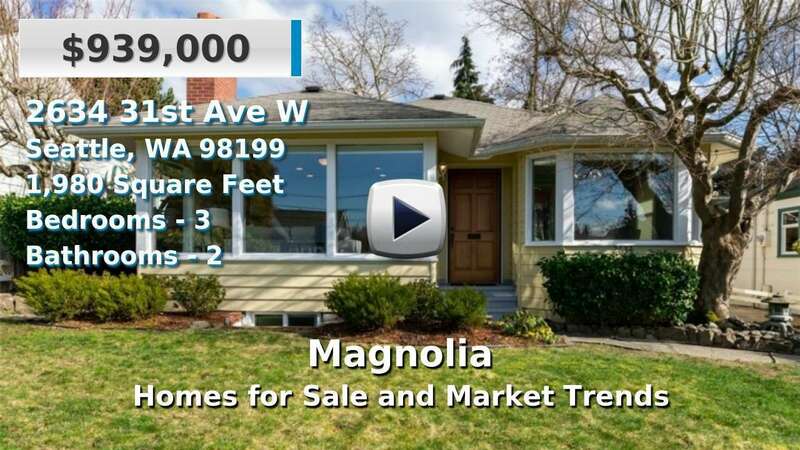 Homes for sale in Magnolia are a mix of average-sized single families, multi-million dollar retreats, and some condos. The area is perhaps best known for Discovery Park, the largest in Seattle, featuring beach access, 12 miles of hiking or biking trails, the remains of military Fort Lawton, a lighthouse, and great bird and seal/sea lion watching opportunities. Many residents even believe the fish market here rivals those of downtown Seattle. 1 Beds | 1 Baths | 807 sq. Ft.
2 Beds | 2.25 Baths | 1662 sq. Ft.
3 Beds | 2.5 Baths | 1320 sq. Ft.
4 Beds | 2.5 Baths | 2950 sq. Ft.
4 Beds | 3.5 Baths | 3194 sq. Ft.
3 Beds | 2.25 Baths | 1416 sq. Ft.
3 Beds | 3.5 Baths | 3360 sq. Ft.
2 Beds | 2 Baths | 1365 sq. Ft.
4 Beds | 3.5 Baths | 2730 sq. Ft.
4 Beds | 3.25 Baths | 2890 sq. Ft.
1 Beds | 1 Baths | 765 sq. Ft.
4 Beds | 3.25 Baths | 4059 sq. Ft.
Blue Summit Realty has the most accurate and up to date Magnolia real estate listings on the web. Currently there are 38 homes for sale, 14 condos for sale, and 5 vacant land properties in Magnolia. Of the 57 total Magnolia residential listings for sale 0 are bank owned, 0 are short sales, 0 are new construction, and 0 are townhomes. The price ranges from $320,000 to $0 with a median list price of $1,123,215 and median sold price of $916,311. Make sure to refine your Magnolia real estate search by property type, price, square footage, bedrooms, bathrooms and more with the search tool above or view the Magnolia listings on our interactive map. Our Magnolia real estate listings were updated 25 minutes ago.